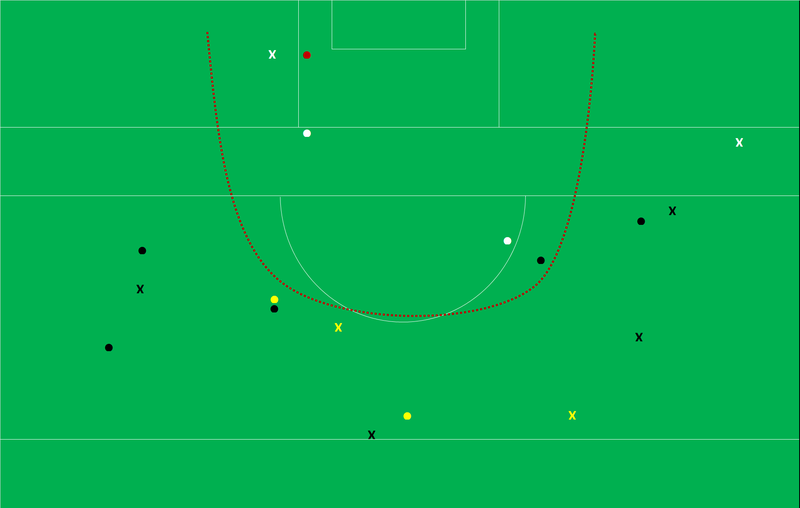 Attack Rates, and Shot Rates, were quite even showing that both teams moved the ball inside the opposition’s 45, and also got shots off once in there, at very similar rates. 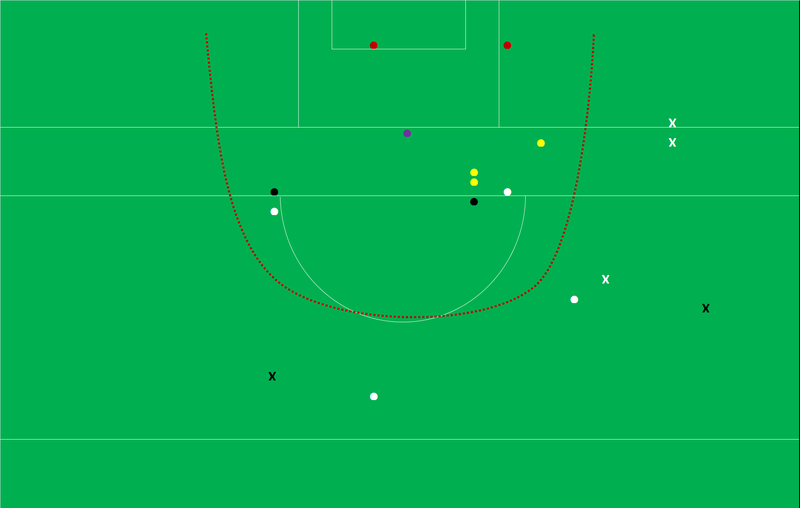 For all that Corofin had 6 extra possessions having three shots less, whilst not ideal, is not insurmountable. It was what the teams did with their shots that was the difference. Slaughtneil’s weighting is somewhat skewed by (a) the fisted attempt in close to goal that went wide and (b) the missed penalty late in the game but there is no hiding from the fact that their shooting was just not up to scratch. Symptomatic of this was that they had six players try one shot apiece – all six missed. A further three players had two attempts at goal missing both. Like in their semi-final (Success Rate of 60% off 15 shots) Corofin were very accurate producing returns above the inter county average. Indeed their whole performance was very similar to their last outing against St. Vincent’s where they produced a stat line of 49 possessions, 32 attacks, 25 shots and 15 scores. The game completely slowed down in the second half with a total of 37 possessions as against the 57 produced in the first half. Slaughtneil showed great fight, producing five more shots in that second half, but again their aforementioned lack of accuracy undid their efforts. Whilst Corofin were deadly accurate in that second half the damage was done in the first where they just blitzkrieged Slaughtneil. There was a 15 minute period where Slaughtneil did not have a shot (from ~8th min to the ~23rd). In this period Corofin got off ten shots scoring 1-05 and effectively built a lead they would not relinquish. Four from fifteen when going for points just won’t do it. It was not as if they were trying absolute spectaculars either as only two of their shots were outside the 20m line on the wings. Also I only charted five of the point attempts having pressure applied – the shooting boots were just not on. Despite being behind for a large portion of the game Slaughtneil did not have an attempt on goal until the 59th minute – something the stout Corofin defence can take a lot of credit for as it was late in the second half before St. Vincents had a shot at goal (from play) as well. Whilst Corofin’s goal was what put real scoreboard pressure on Slaughtneil it was Lundy’s burst of three point in under 90 seconds mid-way through the first half that really underlined the difference in the teams. He was deadly accurate for Corofin over the two games with a combined stat line of 7 points from 10 attempts (weighting of +2.069); simply outstanding accuracy when the average return is c45%. Over the semi-final and final Gary Sice was seven from seven from frees with a weighting of +1.176. That sort of reliability is priceless. Bradley gets somewhat badly treated given his three attempts were all in and around the 45m line but having converted the first you would have high hopes of getting one from the subsequent two attempts. In the aforementioned 15 minute spell, where Corofin scored 1-05, they hemmed Slaughtneil in winning four of the kickouts that resulted from the six scores. It was somewhat surprising that Slaughtneil did not try to relieve the siege by getting their hands on a short kickout or two. It was obvious that their strategy was not working when they lost 8 out of their first 11 kickouts but they never deviated. Indeed in what must be a record in such back to back high profile games Slaughtneil didn’t hit one short kickout in either the semi-final or the final. Although one of their short kickouts went astray Corofin were always in control of their own ball. Overall a pretty even game except for when it came to the sharp end of the attack. Both teams had, relatively speaking, the same volume of possessions and attacks but Corofin were more adept at getting shots off and were also more accurate with the shots they attempted. A quick note on the possession and shot volumes. The possession volume is a new metric but Kerry & Mayo combined for 96 possessions in their opening league encounter – over 70 minutes. 97 possessions over 60 minutes indicates just how free flowing the game was. Similarly pro rating an average of 37 attacks at inter county level to 60 minutes means that the average shots per team should have come in at 31.7 – these returns are bang on inter county standard. Interesting half on half comparisons. Corofin were brilliant in that first half getting 16 shots from 19 attacks whilst also returning well above inter county standard on their shooting. Returning a 56% Success Rate and a positive weighting whilst missing a penalty is very impressive! 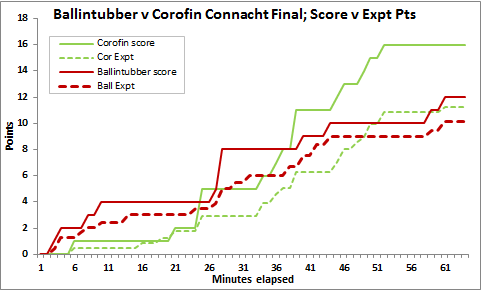 St. Vincent’s execution in that first half matched Corofin’s overall excellence converting 70% of their shots. Quality on quality. Unfortunately for both the returns dipped in the second half however this was more troublesome for St. Vincents. They could not maintain the shooting accuracy only scoring three points from ten attempts. Without a significant uptick in shot production this drop off enabled Corofin to get over the line quite comfortably in the end. Going for points both teams recorded 50% Success Rates; Corofin – 8 from 16 with a weighting of +0.47; St. Vincents 7 from 14 with a weighting of +0.31. Corofin however scored 1-02 from their 4 goal attempts whilst St. Vincents returned nothing from their two attempts. This (and the penalties of course) was the real difference between the teams. We can’t really leave here without mentioning Michael Lundy. He was on fire converting 4 of his 6 point attempts but it is the hidden stats, that won’t show up anywhere else, that are more impressive. It was he who was fouled for Sice’s three free kick conversions. It was he who set up Farragher for the goal right after providing the pass into Sice for the penalty. Oh he also provided at least one assist that I saw. All immense. But what I liked best was Corofin’s third point and his first. It came immediately after Vincent’s totemic player, Darren Connolly, had gotten on the score sheet with a lovely point from the right. Next attack Lundy takes it upon himself to shoot. Consciously or otherwise it was a statement of intent and defiance. The deadballs really revolved around the penalties. In three years 88% of penalties have been converted hence why Delany’s weighting is so negative – a penalty miss is rare enough. On the flip side Quinn’s weighting doesn’t really get a bump for converting his. It was also interesting how both teams approached their respective 45s. St. Vincents took their time relying on Quinn (whose attempt dropped short) whereas Corofin took a quick one looking to engineer a shot closer in. St. Vincents struggled here. Whilst they won the same volume of kickouts as Corofin they converted three fewer of these wins into attacks. 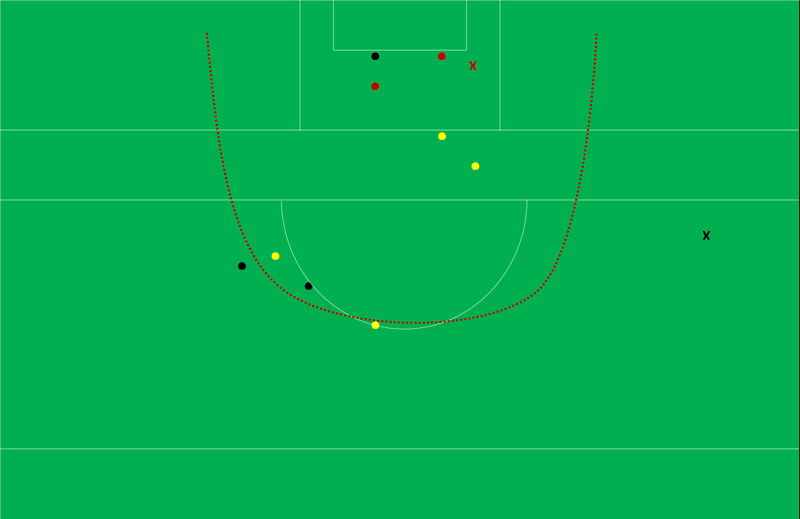 Dig deeper again though and you’ll find that Corofin converted six of the nine shots that emanated from winning kickouts into points. St. Vincents? Only the one.